You can remove unwanted body hair without the nicks, cuts and prickly stubble that shaving often leaves behind. 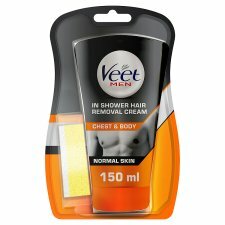 Experience smooth skin with Veet men in-shower hair removal cream with silk and FreshTM technology, which removes hair quickly and effectively leaving the skin smooth. It not only hydrates skin for up to 24 hours, but its fragrance technology also ensures that there is no lingering malodour. Its formula is designed to work close to the root and removes even very short hair. smooth skin in just 5 steps Before using, please read pack precautions carefully. 1 Before you shower, use the soft, coloured side of the sponge to apply the cream evenly onto dry skin. Don't rub it in. Make sure the hair you want to remove is completely covered. Don't forget to wash any cream off your hands. 2 Wait at least 1 minute before stepping into the shower. 3 Now continue with your normal shower routine. For the first 2 minutes in the shower, try to avoid putting the cream directly in the stream of water, so that it stays on long enough to work. It is usual for some cream to gradually wash away at this stage. 4 Not that the cream has been on your skin for 3 minutes in total, use the white side of the sponge to remove a small test area of cream. If the hair comes away easily, remove the rest. If your hair is more stubborn, you can leave the cream on for up to 3 more minutes - but not any longer, as you don't want to exceed a total of 6 minutes with the cream on your skin. For more sensitive areas use the soft, coloured side of the sponge to remove the cream. 5 Rinse your skin thoroughly with water to remove the cream completely, and then dry. Rinse the sponge and dry it, and keep the tube closed when not in use to make sure the cream stays effective.